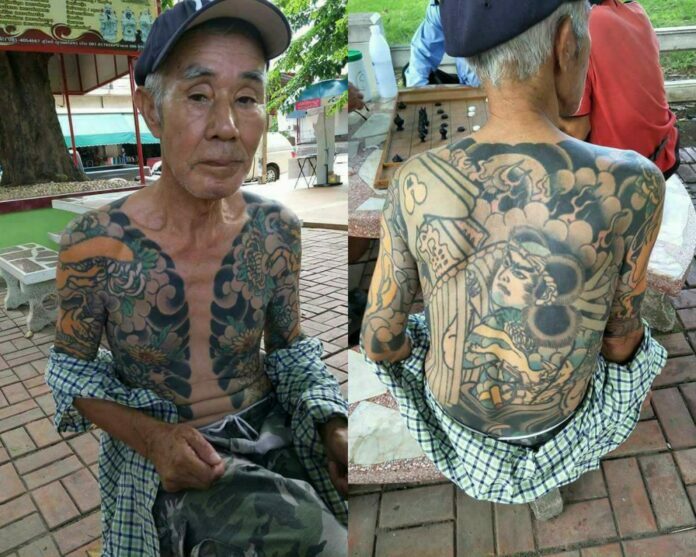 LOPBURI — A suspected Yakuza assassin avoided the law for 15 years in Thailand until Wednesday, after he was betrayed by his own hikae, or ritual sleeve tattoos. Shigeharu Shirai was playing chess when the police closed in on him Wednesday afternoon in Lopburi city, five months after photos of his impressively inked arms made a splash on social media. Shirai is a suspected member of Yamaguchi-gumi, Japan’s largest yakuza organization, and has been on the run in Thailand since 2005. Shirai is among Japan’s most-wanted fugitives, according to Col. Ukrit Phuklan, deputy police commander of Lopburi province. He and seven others are accused of killing the leader of a rival yakuza gang in 2003 before escaping Japan. In addition to tattoos all over his body, Shirai’s left pinky is missing, suggesting he participated in the yakuza ritual of yubitsume, in which members must chop off their own finders to atone for serious offenses. The 74-year-old man reportedly has a Thai ex-wife Arisara Aranuwetchapan, 60. Police got wind of his whereabouts after someone posted photos of Shirai’s tattoos to Facebook in August, praising them for their aesthetics. “Uncle, you’re my idol. Am I going to be handsome like you when I’m older?” Tepparin Inchan said in the post, which went viral and was picked up by several media agencies. Shirai will be charged with illegally entering Thailand, Ukrit said Thursday. Then police will hand him over to Japan. The Yakuza are one of several transnational criminal organizations that operate in Thailand. Shigeharu Shirai on Wednesday at a police station in Lopburi province.